There are a million great reasons to hit the gym every week. Whether you’re looking for the challenge of a fast-paced group fitness class, the guidance of a personal trainer, or the support from a community of invested members, the gym is the perfect place to get motivated and log a great workout. But, let’s be honest. Life gets crazy sometimes, and you might not be able to make it to the gym for every single workout. 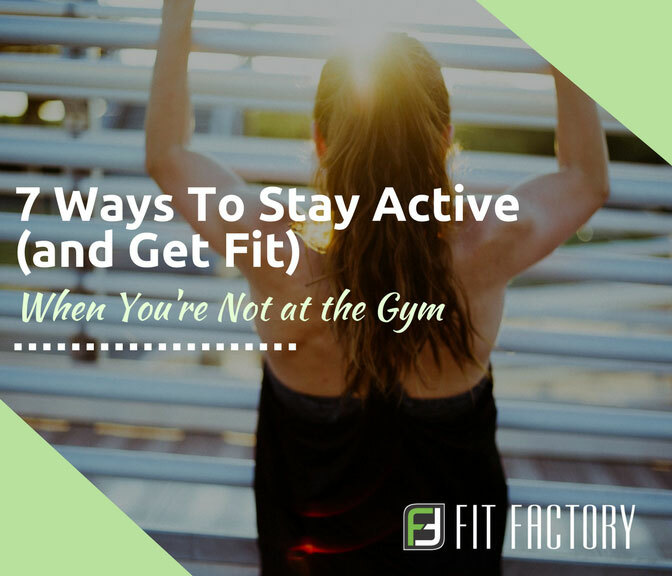 So, how can you balance your busy schedule, stay committed to your fitness goals, and complete your target number of workouts every week...even if you can’t make it into Fit Factory every time? Here are seven ways to stay active (and get fit) when you’re not at the gym. If your busy family life makes it hard to workout at the gym as often as you’d like, include them in one of your weekly exercise sessions. Sure, they might not want to lift weights with you, but you could take a bike ride together, rent stand-up paddleboards, or check out a local ice rink together. You’ll get in a great workout and also enjoy quality time with your loved ones. Next time a friend invites you to brunch or coffee, ask if they’d be up for a workout date instead. Check out a local hiking trail together, or simply jog around one of your neighborhoods. Getting a scheduled workout on the calendar will keep you accountable, and you’ll get to catch up with your friend while staying on track towards your goals. Young children making it hard to fit in your daily workouts? If your normal morning gym sessions aren’t happening, try adjusting your schedule to match your kids’ schedules. When your little one is ready for nap time, get out your jogging stroller and go for a run. Or, when they’re ready to play at the park, bust out a zero-equipment, bodyweight workout on the sidelines. Traveling for work (or for fun)? It’s hard to stay on track with your diet and fitness goals when you’re out of your normal routine, but a little bit of planning can go a long way. Pack your gym shoes, bring a few protein shakes or energy bars, and book a hotel with a gym. Bonus: daily workouts while you’re traveling will help you maintain healthy energy and stress levels. For the days when you can’t get to the gym to work out with a Fit Factory personal trainer or group class instructor, search YouTube for a motivating exercise video. Whether you’re interested in yoga or HIIT, there’s an option for everyone! Although it might take some time to find a coach or teacher with a style that you love, online videos are a great resource for days when you can’t be at the gym. On your busiest days, when it feels like you don’t have a minute to spare, get your workout out of the way first thing in the morning. Even if you can’t swing a trip to the gym, squeeze in a mini exercise session before the craziness of your day takes over. Complete a burpee challenge or short yoga flow in your room as soon as you get out of bed...then let those endorphins fuel your productivity for the rest of the day! Don’t make your workout more complicated than it needs to be. If you can’t make it to the gym, keep it simple and focus on staying active. Go for a short run with your dog, park a little ways from work to get in some extra steps, and do ten squats or push-ups every time you use the restroom. Incorporating movement in your daily routine will go a long way towards helping your reach your goals. When your schedule and your responsibilities make it difficult to hit the gym, you might be tempted to make excuses, skip a few workouts, and lose motivation. But instead of giving up when your calendar gets crazy, choose to find a way to accomplish your goals anyway. You’ll never regret a workout.